When it comes to NFL running backs, Emmitt Smith is obviously one of the best. Few can match his durability and production and even less players have enjoyed his team success with the Dallas Cowboys. 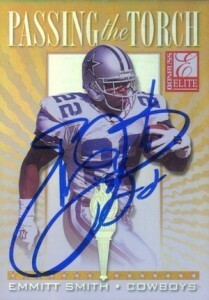 Many years removed from his playing days, Emmitt Smith cards and autographs still hold a special place for collectors. The NFL’s all-time rushing leader had the misfortune of making his cardboard debut in the 1990s, but that does not mean that valuable cards don’t exist from throughout his career. 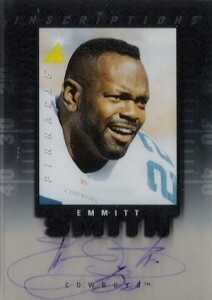 The following list looks at ten of the top Emmitt Smith cards available today. 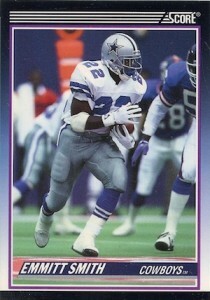 For a complete guide to his rookie cards, view our Emmitt Smith profile. 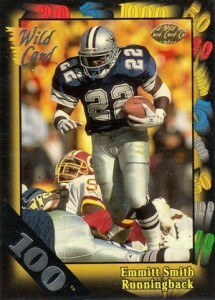 Kicking off the list, 1990 Score Supplement offers the top Emmitt Smith rookie card. It maintains solid values despite the higher production runs of this period. Pro Set is not normally associated with high values, but they achieved that with a relatively rare Platinum insert. 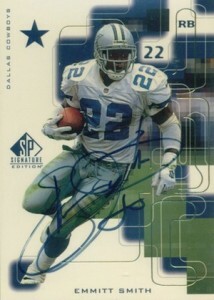 These Emmitt Smith cards are hand numbered to 650 and are actually made with 1.28 grams of real platinum. Although they were found in Series 2 boxes, don't expect to pull them as they were inserted as redemptions cards that have long expired. 1991 Wild Card was monumental for the hobby with their introduction of popular parallels. The Stripe parallel cards featured various denominations from five to 1,000, and could be redeemed for the number of base cards referenced. 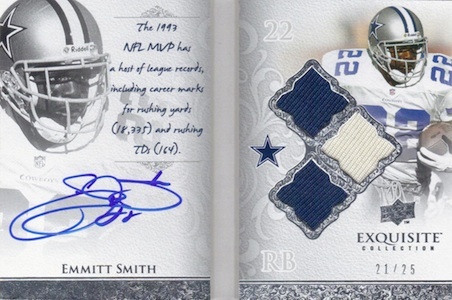 The higher the number, the rarer the card, which makes for an interesting option for Emmitt Smith collectors to try and track down all six versions, plus the base. Although the Brett Favre first-year card might get more recognition in 1991 Star Pics, this autographed card from Emmitt Smith was the first signed option available to collectors. 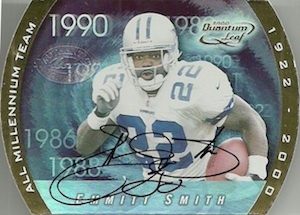 The card design itself did not look great at release, and time has not helped that, but the back holds the true significance with an on-card Emmitt Smith signature. Also, the release is plagued by counterfeit issues, so unless you are very knowledgeable on Smith's signature, stick with versions that are authenticated by a reputable company. Pinnacle was known for their innovative designs and the on-card Inscriptions autographs are a great example of that. Hand-numbered to 220, these cards still surface from time to time. Although they are numbered to 1,500, only the first 100 cards are signed. Emmitt Smith has two different autographed cards, including a dual signed card with Fred Taylor and a card signed only by him. The card shown below is from the dual signed card. SP Signature Edition brought collectors an autograph in each pack and this on-card autograph from Emmitt Smith remains very valuable. The rare Gold parallel is shown below. The subtle gold foil is the only noticeable difference and both versions command strong prices. A die-cut design and eye-catching look are enough to make a card special, but the on-card autograph and limited print run makes this a top Emmitt Smith card. While Exquisite Collection started in basketball, it also made its way to other main sports. The premium product includes plenty of football options, but the Autobiography booklet card stands out with the triple jersey relics and on-card signature. 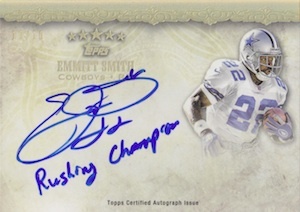 Five Star is another premium football product and in case you somehow forgot Smith's NFL relevance, the card features an inscription that reads," Rushing Champion." This Quotable Signatures card is limited to only ten cards. 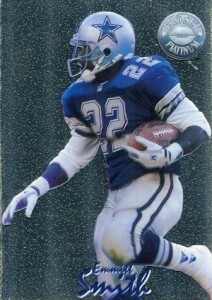 Emmitt Smith Dallas Cowboys Football Legend 1995 Playoff Prime FANTASY TEAM. Super Bowl Bump - Which Players Will Gain the Most from a Super Bowl Win? 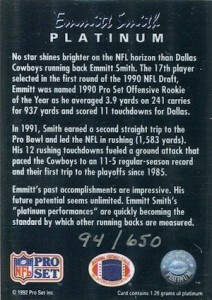 How Much Is A 1991 Pro Set 1.28 Platinum Card Of Emmitt Smith Worth? 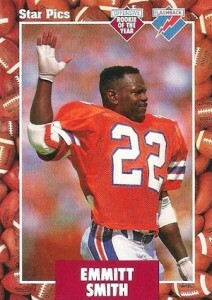 I have a wheaties box with 7 best shots of Emmitt Smith in action on the football field as the all time rushing leader. Even Emmitt himself would want these shots of himself . These pictures are about 15 years old. Whats the value of them. Let me know. The Star Pics autograph pictured above is a counterfeit auto. The true era specific, and non counterfeited autos are truly hard to find, but literally 50% being non era correct and the other 45% being counterfeit, only about 5% of the star pics are real and period correct. I have 2 Emmitt Smith error cards that reflect EMMETT SMITH for name and identified as A.S.M .4 on the back Can someone tell me where I could find some information on these error cards? email to me would be GREAT!!!! 2016 Panini Flawless Emmitt Smith Autograph Jersey Patch Card #5 5 Cowboys Nice!